Autobots and Decepticons waging war against one another is a pretty timeless conflict. One side gains an advantage, only to see that advantage wiped away at the advantage of the other. 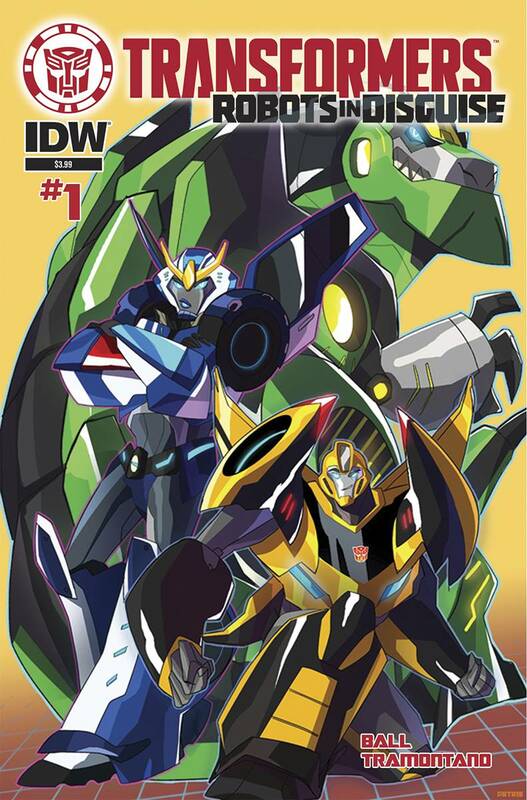 It still makes for fascinating entertainment and IDW Publishing is tapping into that with Transformers Robots in Disguise Animated #1. The issue is written by Georgia Ball, illustrated by Priscilla Tramontano and lettered by Tom B. Long. Bumblebee leads an all-star team of Autobots to Earth to find rogue Decepticons...but in this all-new story based on the hit Cartoon Network animated series, they find more than they bargained for! Full credit to Ball: she's managed to take a franchise that's recently been a lot more mature and restore some of the lighter aspects of it for readers. Bumblebee still remains as a very accessible lead character in that regard--as an Autobot capable of leading like Optimus Prime yet a bit friendlier and more optimistic. Ball fills the issue with an abundance of Autobot banter, right down to the constant competition among the characters for silly reasons. The dialogue is one of the really fun parts of the issue, as it reminds the reader that Ball isn't taking things too seriously and is committed to keeping Transformers Robots in Disguise Animated #1 tied closely to the animated series it's a continuation of. The dynamic shared among the Autobots is quite entertaining and captures the essence of what makes them all different in their own ways. Artistically, Tramontano is relying heavily on an anime-inspired look for Transformers Robots in Disguise Animated #1 that underscores the seemingly innocuous nature of their problems. The highly stylized approach personifies the Transformers a bit, removing some of the more rigid blockiness for curves and an increasingly organic feel. In fact, many of the characters actually look more like people and animals than Transformers, which furthers the book's kid-friendly appeal. The bold, striking colors remind the reader that these Autobots and Decepticons are more on the family-friendly side than anything. Tramontano's panel layout is pretty simplistic, relying on a traditional grid format for conveying the mix of action and Autobot planning. Transformers Robots in Disguise Animated #1 is a very family-friendly approach to the series, eschewing the gloom and doom of the Cybertronian war's fallout for a bit more tongue in cheek humor. Bumblebee continues to lead Autobots and attempt to become a better leader in the process. The plot of the issue is relatively familiar as it focuses on Bumblebee working alongside humans and a cadre of other Autobots to find and detain Decepticons, but Ball manages to give the issue some breaths of fresh air. Tramontano's renderings of the characters is fluid and clean, drawing heavily upon cartoon stylings as an influence. Transformers Robots in Disguise Animated #1 will appeal to fans of the cartoon, as well as Transformers fans in general looking for a slightly lighter take on the characters and property. 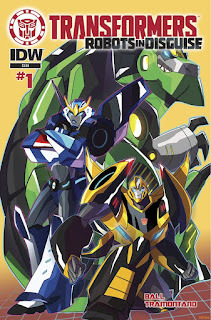 Transformers Robots in Disguise Animated #1 is in stores now.